The guide below shows you how to add a funnel report in 6 steps. Click on NEW FUNNEL from the funnels section. 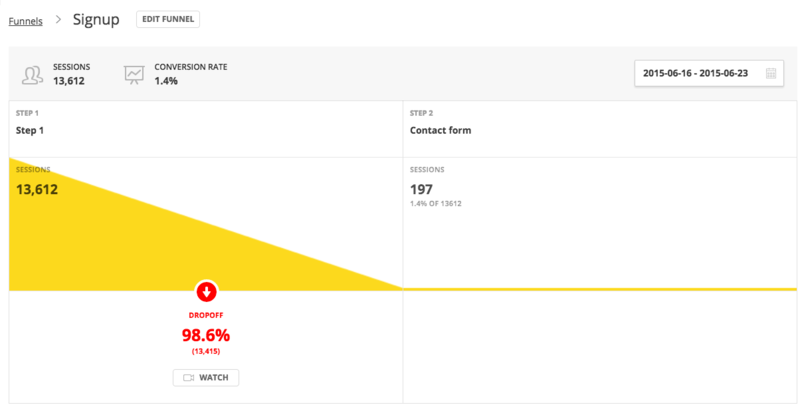 This will load the funnel creation page which will allow you to specify what pages you want your funnel to track. Give your Funnel a name. Enter the pages you want your Funnel to track. For more information on how to target specific pages, read our Page Targeting Explained article. Once you add a Funnel to Hotjar, it will appear in your Funnels list. Your Funnel will contain data collected from the past 90 days. To see your Funnel, click the VIEW FUNNEL button. If you know for a fact that your Funnel should contain data but you are seeing no or incomplete data, check our Troubleshooting article for more information on why this could be happening.